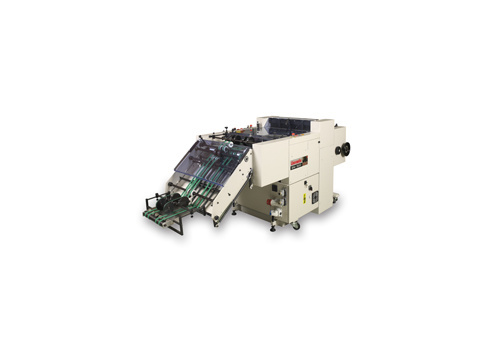 The EM520 punching machine is designed to punch, cut tabs or trim signatures in line behind high output folders (up to 10,000 signatures / hour) linked through the dedicated RS520 interface. It can also be fed from the dedicated SF520 stand alone feeder. The EM520 can be operated with a single action tool for punching only applications or with a double action tool which allows to punch on the folded edge a perforation line and on the unfolded edge one or more tear-off perforations, straight cuts or index tabs in one sequence. The EM520 can take up to 520mm/20" (single action tool) or 420mm/16" (double action tool) wide signatures of up to 2.5mm thickness.